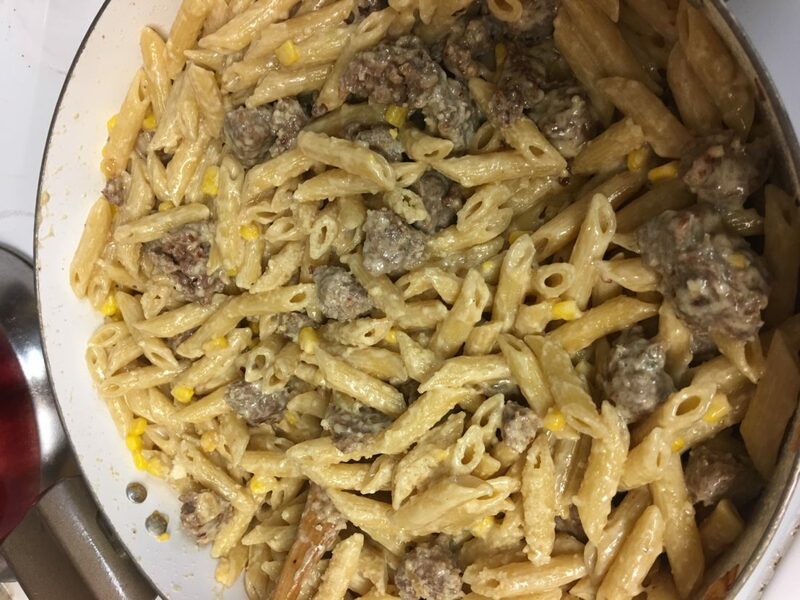 Photo by Amy Phelps Penne with Corn and Spicy Sausage is a great weeknight meal. De Laurentiis, with photos and recipes, returns to native Rome to show how to live a la dolce vita. She shares her authentic Italian dishes with home cooks in a way that is accessible and easy to approach. The recipes are divided into Starters, Lunch, In-Betweens, Weeknights, La Dolche Vita, Sides and Sweets. Starters include recipes for Potato Crisps with Goat Cheese and Olives, Antipasti in a Jar, Ham and Ricotta Pinwheels and Crab Arancini. Lunch recipes have Spicy Sausage and Escarole Soup, Pappa Al Pomodoro, Calamari Panzanella and Sicilian Tuna Salad Sandwich. In-Betweens offer recipes for snacks like Sausage and Broccoli Pizza, Crostini with Smoked Trout and Mozzarella and Strawberry Bruschetta. Weeknights include recipes for Lemon and Pea Alfredo, Italian Chicken and Rice and Lemon Sole Orgenata. La Dolce Vita has recipes for Spicy Lamb Bolognese, Tricolore Stuffed Pork and Slow-Roasted Salmon. Sides offer Asparagus with Grilled Melon Salad, Italian Carrot Salad and Charred Broccoli Rabe. Sweets ends things with Olive Oil and Honey Panna Cotta, Mascarpone Sorbetto with Rosemary Honey and Hearty Chocolate Chip Cookies. One night I made Penne with Corn and Spicy Sausage. It is a quick making dish, about 15 minutes or so, and uses sausage, shallots, corn, mascarpone cheese and noodles and that’s about it. It is a great weeknight meal when you are busy and made a bunch of leftovers that my husband and his coworkers enjoyed for lunch the next day! For those wanting a culinary tour of Italy from the comfort of your home, check this book out. “Giada’s Italy” is published by Clarkson Potter. It is $35.